Tibet. The name alone is mythical. It conjures up images of temples, snow-capped mountains buddhist monks, vast landscapes and a place where time has stood still. While most of this is true, Tibet is changing fast. I made my first visit to the region in 2012 and have been lucky enough to have been back numerous times since. It’s an incredible place that fills me with genuine joy to travel around. The landscapes are indeed breathtaking. Endless grasslands. Mountain ranges that dance against the sky to dramatic sunrises and sunsets. A beautiful and largely nomadic people who roam the grasslands with their herds of animals to the tune of the changing seasons. Much of this has not changed for thousands of years. Development has come to Tibet though and life is changing fast. Economic changes are transforming the major towns and cities as government-funded projects transform urban areas. Tens of thousands of nomads have left the grasslands and climate change is altering the glaciers that cling to the side of alpine mountain ranges. This past summer, I had the opportunity to travel back to Tibet, spending time in and around the capital, Lhasa. Many people that follow my work on Instagram and Facebook where curious to know how I arranged to travel there. What were the logistics? How do you get around? I thought I would write this post to help those who wish to visit the region. In 2019, I shall be leading a new photo-expedition taking a small group of photography-enthusiasts from Lhasa to Mount Everest base camp. This post shall be a small primer and helpful list of things to do and expect on one of the journeys into Tibet, the train from Xining to Lhasa. 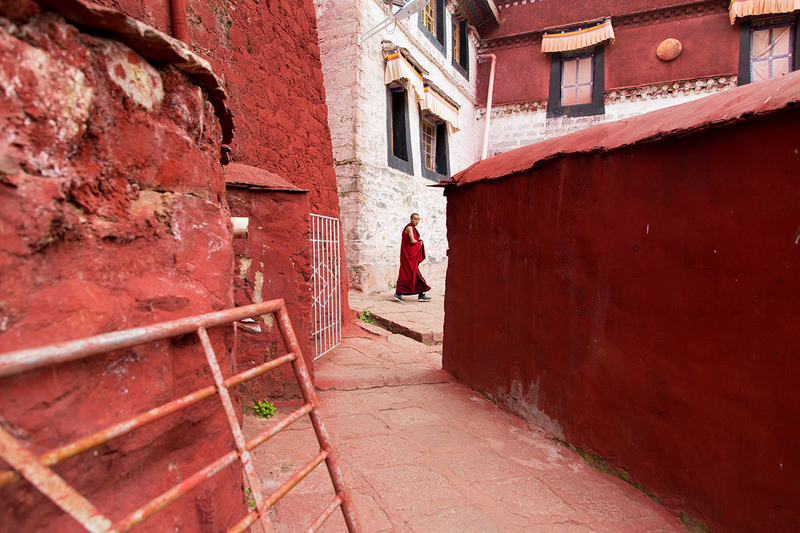 One of the first choices you will need to make when planning a trip to Tibet is how you will get there. You have two main options. By plane, or by train. Let’s consider each. By far the easiest and quickest way to get into Tibet. There are numerous flights that fly direct into Lhasa from major cities in China such as Beijing, Shanghai, Guangzhou and Chengdu. These can be easily booked through your personal choice of online travel agent. Lhasa Gonggar Airport (LXA), to give it its official title, sits at over 3500m above sea level and is located roughly 60km south-west of Lhasa. By taxi, it takes roughly 30mins to get to the city. It’s a nice modern airport with many shops and small restaurants, servicing the thousands of domestic Chinese tourists that visit Lhasa each week. The first major downside to flying into Lhasa, is for health reasons. Sitting at over 3500m metres, altitude sickness is an obvious concern. Most travellers will be coming in from low-lying cities at close to sea level and arriving suddenly at altitude is not recommended by most health professionals (do speak to your personal doctor/physician before travelling to altitude). It is strongly advised that you take your time ascending to altitude, preferable over days, rather than hours. Taking this into consideration, the only other real option is by train. When leaving Tibet however, flying is certainly a good option to get you quickly to your next destination. The health effects of descending from altitude are far less of a worry than ascending. The train route that I recommend for people to travel into Tibet is from the western city of Xining (Qinghai Province) into Lhasa. This line takes just under 24 hours and takes in some of the most spectacular views in the region along its almost 2000 km route. 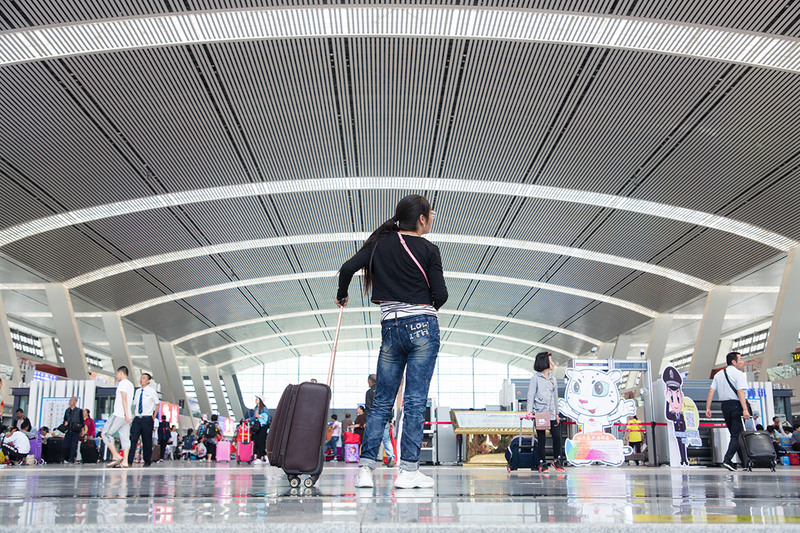 There are many ways to get into Xining, but the most common is by plane. There are direct flights into Xining from most Chinese cities. Once you arrive, it’s a good idea to spent 24-48 hours in the city before you board the train, just to give you a chance to acclimatise to the slight increase in altitude. Xining itself sits at around 2,200 metres. There are some interesting sights around the city that are well worth a day-trip, such as Qinghai Lake, a beautiful turquoise saltwater lake west of the city. Xining train station is a large and modern Chinese train station. 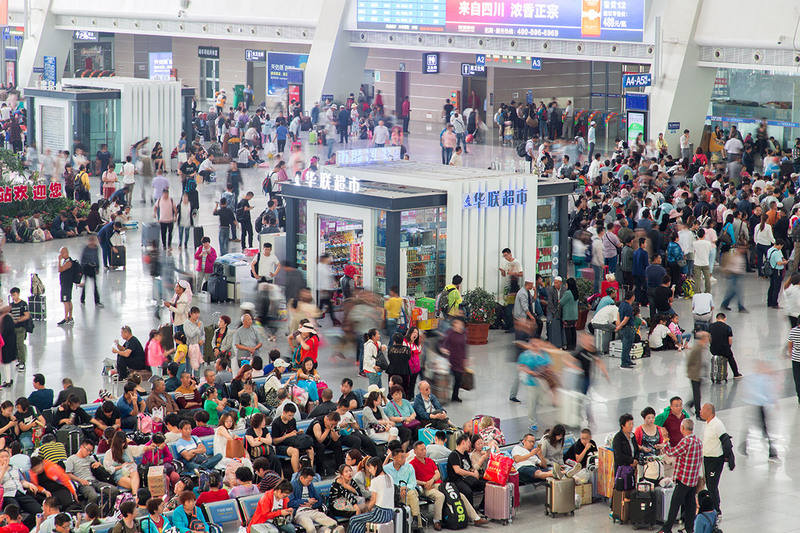 Serving as one of the main transport hubs for ordinary people to get into Tibet, it is thronged with hundreds of passengers at most times of the day. It makes for a fascinating experience as you see people from all walks of Tibetan and Chinese ways of life. This is one thing you should do well in advance of arriving in Xining! 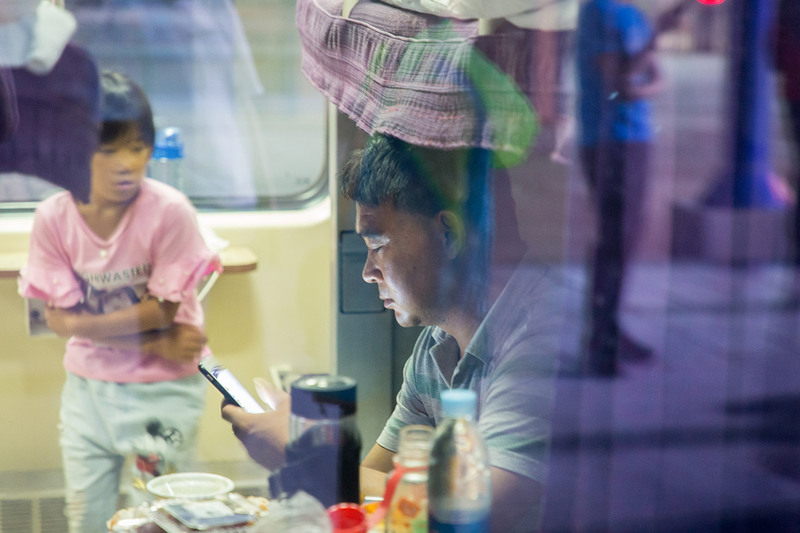 Tickets on Chinese trains get booked days, sometimes weeks in advance, so planning when one where you will buy your ticket is an important part of the planning process. There are a few ways to book a train ticket in China, (i) if you are staying at a 4* hotel or above, there is likely a service at the hotel which will help you book tickets. You will have to provide your passport details to them and pay in advance. (ii) Ask a local Chinese friend to help you book tickets online through one of the main train-booking websites. (iii) Go to one of the ticket selling kiosks that are found throughout major cities. Again, you’ll need a local friend to help you here unless you speak Chinese. Just make sure you do this well in advance of your proposed leaving day for the Xining to Lhasa journey. There are a few different types of tickets you can book. Basically, the choices are (i) soft sleeper – 4 beds to a room, (ii) hard sleeper – 6 beds to a room, and (iii) hard seat – seat in a regular style train carriage. I highly recommend booking either a soft sleeper, or a hard sleeper. When doing so, I also recommend booking the bottom beds as this will allow you to have a window seat for the whole journey. This is one of the main confusions for people when travelling to Tibet. For some parts of the region, you need a special permit to travel, for others you do not. If you take out a map of the region, you will see that physically there is one very large area called the Tibetan Plateau. This highland region covers almost one third of south-west China and covers an enormous area bordering Nepal and the Himalayas. China is broken up into numerous provinces, the rough equivalent of States in the US, or counties in the UK. The ONLY province you need a permit for is the Tibetan Autonomous Region (TAR) which includes Lhasa. The Tibetan Plateau itself stretches into the provinces of Qinghai, Yunnan and Sichuan. If you are planning to visit these parts of the Plateau, you do not need a permit. You are free to travel, as long as you don’t venture too close to the border of the TAR. These regions are also wonderful to travel in and you can still see Tibetan culture in most parts. 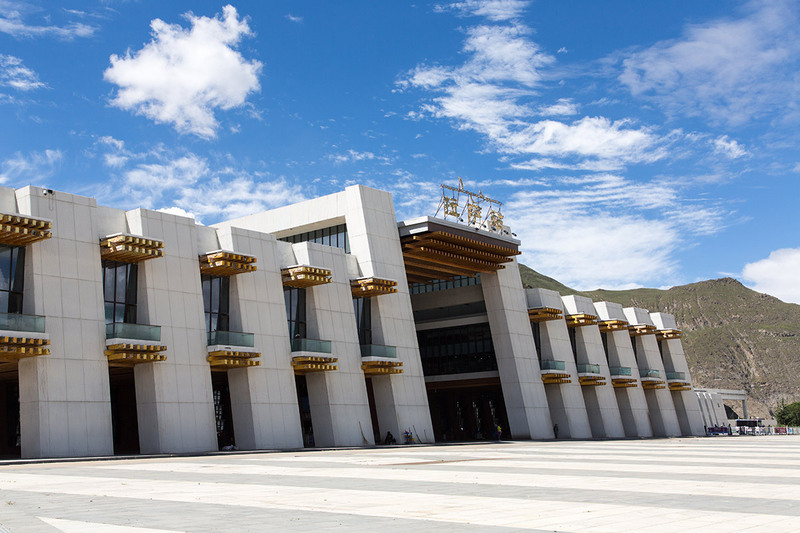 For those of you who are planning to travel around Xining, you don’t need a permit but if you are getting the train from Xining to Lhasa, you will need a permit as you’ll be going into the TAR. Permits are organised mainly though Chinese travel agents. On our photo-expeditions, we work with a local company who will help organise all permits for visiting TAR. All you need to do is supply copies of your passport and visas, they will do the rest. 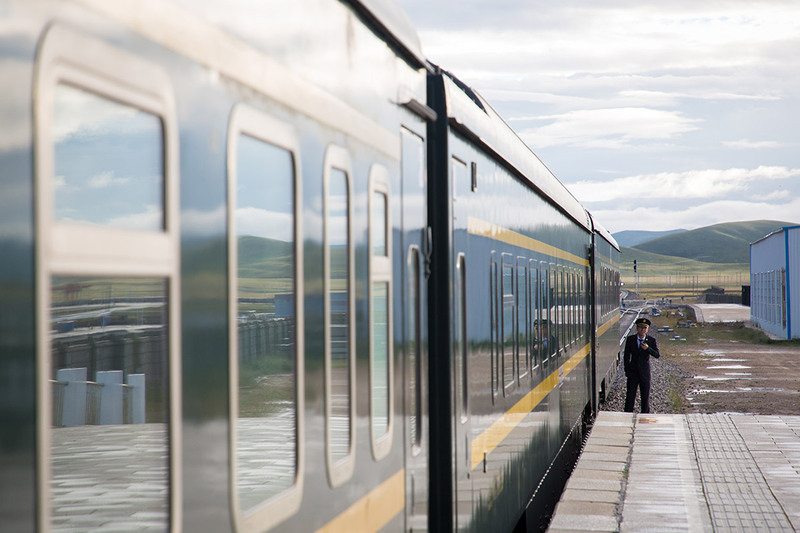 When boarding the train from Xining to Lhasa, officials will ask to see your permit before boarding the train. When travelling by train, you only need a photocopy of the permit. If travelling by air directly into Lhasa, you will need the original permit, so you’ll need to organise that directly with your tour company. The process of applying for the TAR permit and receiving it can take anywhere from 10-14 days, so make sure you start the process early with your tour company. When you arrive into the TAR, you should keep copies of your permits on you at all times. They will often be checked when you go into popular tourists sites. You local tour guide will likely also have copies, as well as the originals to show officials. Please note that the permit situation can change suddenly depending on local political situations. Check with your tour guides for the latest information. So, you’ve made it to Xining, you have your tickets, you have your permits for the TAR, now it’s time for the enjoyable part, the journey. The route will take you west out of Xining, skirting to turquoise waters of Qinghai Lake and through the provincial town of Delingha, before sweeping south-west steadily rising into the heart of the Plateau. You’ll pass through the town of Golmud, glimpse Mount Tanggula at near 5000m and then enter the TAR through rolling grasslands and mountainous passes. Of course, depending on the time of day which your train leaves Xining, you will see a varying degree of these sights. If you have been lucky enough to secure yourself a bottom berth in either a soft sleeper, or hard sleeper carriage, then the majority of your journey should play out pleasantly as a stream of natural views as you pass along the Plateau. Depending on your fellow travellers, you may end up sharing your room with some buddhist monks, a Tibetan family or a group of domestic Chinese tourists. It’s down to pot luck who your companions will be but that’s one of the exciting things about this type of travel. The train itself is comfortable and clean. Each carriage has toilets and open sink area for freshening up. Don’t expect too much privacy however! It’s rumoured that oxygen is pumped into the carriages to help people deal with the changing altitude. If you have stopped for a few days in Xining, the acclimatisation should be better for you but be prepared by having your own pain medication to hand and plenty of water to stay hydrated. At the beginning of the journey you may be asked to fill out a ‘Passenger Health Declaration Form’. Don’t be alarmed. It seems this is required from all passengers and is some form of liability cover for the train company in case you get severely ill. Unlikely, but you have no choice but to fill it out. In terms of food, it’s advisable to pay a visit to a supermarket in Xining before you leave to stock up on snacks, drinks and instant noodles. There is food available on the train, mainly supplied by attendants selling meals from trollies they push through each carriage. There is also a dinner car where you can sit down properly and eat. As a captive audience however, the food is over-priced and unsurprisingly average in quality. Along the route you pass through a variety of landscapes, so make sure you always have your camera to hand. You never now what kind of scene you may encounter. When leaving Xining, make sure to keep an eye out from the left side of the train to catch a glimpse of the beautiful Qinghai Lake. This spectacular body of water really helps start the trip in spectacular fashion. The journey is quite long so you have plenty of time to explore the train and perhaps photograph your fellow passengers. Remember to always be polite and respectful. Use the Tibetan phrase ‘Tashi Delek’ (hello) when you meet someone new. Try to converse with them first and try to make them feel comfortable before taking their picture. As the train arrives into Lhasa you will notice the large, spacious and modern station it pulls into. Let the masses rush off the train and take your time to soak in the last moments of the journey you have just made! As you disembark, just follow the crowds as they head for the main exit. The most important occurrence here is that you will likely be stopped at the exit by police officers who will check your passports and travel permits. They will likely take you to a small building next to the exit where your details will be run through a computer and checked. Once you have been given the all clear, you can leave. If you are part of a tour group, then it’s very likely that your guide will be waiting for you near the main road. All arriving passengers are funnelled through to one exit. If you are not being met by a guide, there are the usuals flanks of taxis that you can negotiate a ride into town in. The journey into town should take you roughly 20-30mins depending on traffic. Most drivers will take you through the centre of town on your way to the hotel. 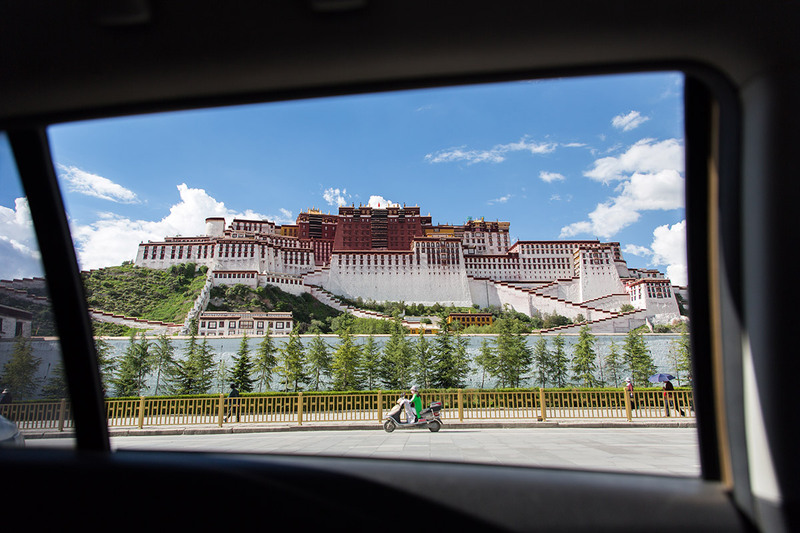 Make sure you sit on the left of the car you are travelling in, as you will likely pass by the Potala Palace which will be on your left hand side. Be ready with your camera to get that first iconic Tibet picture! 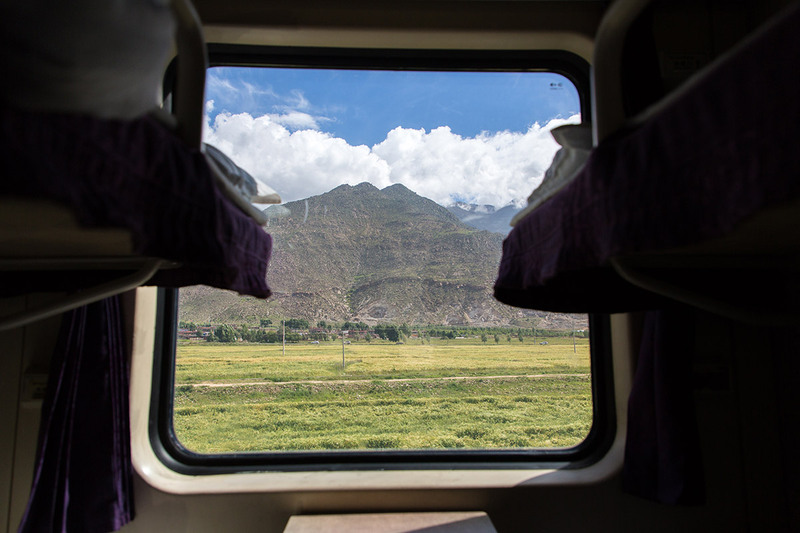 The Xining to Lhasa train is one of the most interesting ways to get into Tibet. Stunning views. Interesting fellow passengers. Plenty of photo opportunities! If you have the time and are prepared to set up the logistics to make it happen, I highly recommend this route into Tibet. I hope this post has been useful to those who are travelling to Lhasa, whether on one of my photo-expeditions or travelling independently. Please let us know how your experience was on this journey. Did you have the same experience? Do you have additional tips? Has something changed since time of writing? Let us know here and share your travel advice too. Join us in 2019 on our new photo-expedition from Lhasa to Mount Everest Base Camp!